Antique Radio Forums • View topic - "Select Language"? I have recently acquired a new drop down menu at the top left of my ARF pages, and only on ARF pages. How do I get rid of it? Post subject: Re: "Select Language"? that sure looks like a Google feature.......I really don't think Alan is about to set up ARF in all those languages. I just tried it in German and it does a reasonably respectable job of translation. Pretty sure it's a Google function. And it works! 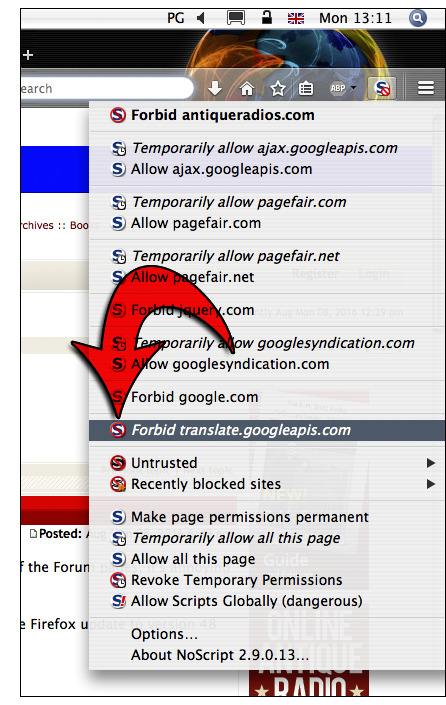 Go into Chrome settings choose advanced settings then goto languagesand uncheck choose to translate pages in other languages and it will be gone. Absolutely, a Google function. Not hiding the fact either. Oh, now I see it, but it really doesn't bother me. If you were to "view page source", you can look in to what it's doing and why. It happens to me on Firefox, Edge and IE. It started last evening about 8pm? and it only happens on the ARF page. I do not have any translator modules/add-ons etc. installed, and it also happens when I browse on my iPhone6, so I have to assume that it is an ARF bug. Somebody at ARF decided to code it into the website. My AV flags all calls to an external script as a possible XSS attack and prevents it from running. It's really not a good idea. Eric H wrote: Is anyone else having a problem with Google Translate popping up at the top of the Forum pages, it's annoying because it causes the page to jump up and down when it's loading. As Stewie would say... Get with the program dude. Last edited by egg on Apr Thu 12, 2018 5:29 pm, edited 1 time in total. Craigslist won't preview pictures, and eBay will barely render at all, it won't let me see large pictures, no tabs, can't see shipping policy, most links don't work. You really run with your browser set up that way? How? I added the option to translate forum pages into other languages a couple of days ago. This was done to encourage participation from people from 227 non-English speaking countries, many visiting that are not proficient enough in English to be able to easily follow some of the discussions. Last month 330,000+ pages were served to those countries. The inconvenience of not being able to read the text on a page of something you may have found in a web search was highlighted by a recent thread seeking to identify a French radio, and the best pages to do so were on a forum in French. This is added as a service that most current users will not need and will never use, but sits in an out-of-the-way spot that doesn't interfere with the placement of anything else you're used to. I understand that there are a number of users here that can't stand change of any sort (I've read all the Windows threads). You'll get used to it. I added the option to translate forum pages into other languages a couple of days ago. This was done to encourage participation from people from 227 non-English speaking countries, many visiting that are not proficient enough in English to be able to easily follow some of the discussions. Last month 330,000+ pages were served to those countries. The inconvenience of not being able to read the text on a page of something you may have found in a web search, and it was highlighted by a recent thread seeking to identify a French radio, and the best pages to do so were on a forum in French. Yes, there are many who dislike "change". There are also those among your members (me included) who don't mind change for the better (which this is) but who also worry when "things" happen to their computer without warning. Because my level of computer knowledge is so poor I worry when these unexpected things happen and thus I go looking for an answer. Now I can quit worrying, knowing that it is harmless and not an event that occurred to my computer. All things considered, a heads-up ahead of time could have alleviated concerns. Change isn't the issue, surprise is. That should be an asset to those who find English difficult to understand. ...You really run with your browser set up that way? How? It's a shame some folks seem to be a little short in the gratitude department for an excellent product that we pay nothing for! I had not even noticed it until you pointed it out.